Low power DC system using the energy recovery highly efficient R.O. boost system. The Quest is engineered for boaters with limited power options whilst still providing automatic operation. 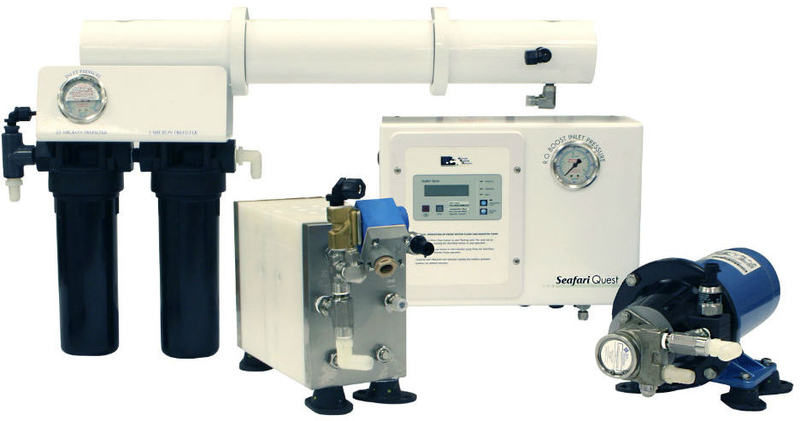 Outfitting your Seafari system with HRO's options and accessories will extend life to your watermaker and lower your maintenance costs. The Remote Control Unit is able to monitor the system's performance and alarm status from the bridge or other remote locations. The Sea Strainer prolongs pre-filter life by trapping suspended solids within the monel mesh screen. Sea Strainers are available in either the traditional plastic housing (SF 170) or the bronze (all other Seafari systems). The new, specially designed Soft Motor Start is a device that can be integrated into the Seafari System. The Soft Motor Start will cut the Seafari system's start-up amps by more than half.